Got a beautiful ramble in this morning and it was cold! At least for this old Florida lady. 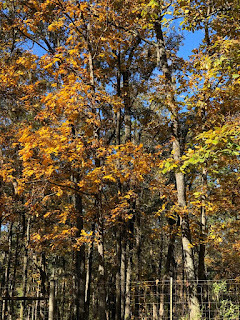 The sky was so blue, some of the trees actually have fall color and I saw woodpeckers and squirrels and heard different birds calling and singing from the pine woods beside the road. I was actually glad to be out. The houses on White House Road where I walk have started their Christmas decorating. Here's my favorite so far. 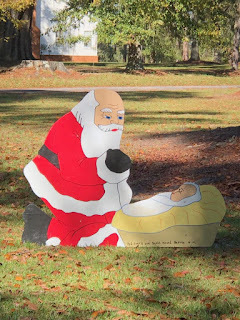 If you can't read what that says at the bottom of the sweet baby Jesus' manger it is, "And everyone shall kneel before Him." Now that's what I call keeping the Christ in Christmas, y'all! The yard where the Halloween decorations were over the top have replaced the pirate ship and dragons with all sorts of lights and seals balancing balls on their noses and what was Boot Hill with gravestones and skeletons on it just a few weeks ago is now the Nativity with a little stable, I guess, and life-sized figures of the Holy Three along with various wise men although one of them has blown over unless it was a camel. I couldn't tell. Nor could I get a good shot of it. I had to go to town for groceries (one cannot live on condiments alone) and saw my beautiful friend Brenda at the Costco. She was wearing the sparkliest silver eyeshadow today I have ever seen which cheered me considerably. I just can't be too upset with anything when I'm around Brenda. She is absolutely proof that with make-up, less is not always more. Sometimes, more is more! And beautiful! I don't know that I'd like the same make-up on anyone else in the world but it is perfect on Brenda. I think it must reflect her shining soul. When I got home I knew I had to do something with the damn porch plants. Mr. Moon's been having some pretty serious back issues and I could not stand the thought of him picking up those heavy pots. So I did a lazy-girl version of frost-damage-prevention and brought some into the house that I can carry and covered the rest up on the porch with my stash of blankets and sheets and old tablecloths that I keep just for that purpose. I have had that same plant or, actually, ancestors of that same plant for at least thirty years. Nope. Not kidding. 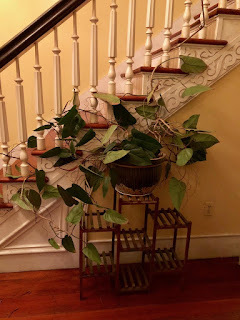 It grows like crazy and sends shoots out that will stick to walls with rooting tendrils. I have at least two other pots of it and also a large vase with some rooting in it. You can root that plant for years without any obvious degradation in its green healthy appearance. It does not care. It's sort of the perfect houseplant. So I did all of that and got clothes off the line and folded laundry and probably did a bunch of other stuff too but nothing very important. I should be exhausted after such a day but actually feel pretty good which is perhaps a result of not sweating for at least 36 hours. Of course I bitched to myself like crazy this morning when I was hanging clothes on the line. My hands felt like they were going to fall off they were so cold. We really are not used to this weather and I noted that many women in Publix looked very well turned-out in their skinny jeans, sweaters, vests and boots. It was like they'd all gotten a memo. They also, to a woman, had chic, funky hairdos and very fashionable glasses. It was a good look and I was jealous and felt quite frumpy in my pilled old black knit jumper and clogs which I didn't even bother to wipe the mildew off of before I left the house. I did wear earrings which for me is making an effort. We will not mention the leggings I was wearing under the jumper which were the same leggings I'd worn under cargo shorts for my walk. Oh, let's just stop there. It's so bad. It always seems as if things can't become any worse or more terrifying or immoral and then they do. And they decorate the White House for Christmas with red "trees" that look like they were made from the pelt of Satan. Hey! Here's a nice picture. 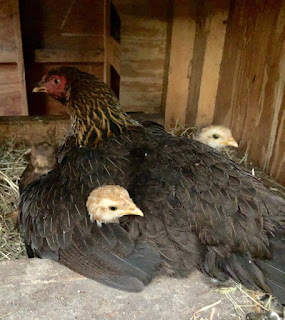 Dearie's little babies are still trying to sleep under her wings and she is doing her best to accommodate them. That little hen has more courage, integrity, love, and devotion in one of her pinfeathers than Donald Trump has in his entire body. You stay warm, too. I have a plant down here with me that came from my grandmother before I was even born. We call it a shamrock, although it is really oxalis or false shamrock. Love these impossible to kill plants. I love the photo of Dearie. The photo of Dearie and her not-so-little ones is one of my all-time favorite pictures ever. Her goodness as a momma is wonderful. Trump's badness as a president is chilling. Speaking of chilling, we had a low of 12 last night here in WI and a high of 22. Brrr. Hey! I'm going to Costco on Thursday to spend my gift certificate! Sweet dreams. I always love reading your blog, Ms. Mary Moon. I laughed and laughed about your hands nearly freezing off while hanging laundry, and how it's going to actually get below 32F in Florida tonight. We live in Minnesota, and this morning it was 6F with a -9 windchill at my son's bus stop! But here's a laugh for you southerners: we had an exceptionally frigid spring this last year, and it stayed about 20F through the end of May. Then in one day it shot up to a sweltering 80F...several Minnesotans ended up hospitalized with heat stroke! I can only imagine what Floridians would have thought of us dripping with sweat and staggering about in 80 degrees. As always, I love the pics of your chickens....because life and politics are too stressful, and chicken pics are exactly what I need right now. Many hugs! Oh, look how sweet Dearie is with her babies! ❤ I love that photo. It's getting down to 29° here in SC tonight. Brrr!! But in typical SC fashion, it will be 75° by the weekend. we're just coming out of a dip into the low 30s and are on a warming trend. you need a dolly for those plants. that's what I use, no carrying the heavy ones, I just roll them into the garage. and I know what you mean, everytime I think Trump and his goons have hit bottom they dig a little deeper, 14,000 children now in detention. and now he's threatening GM for laying off workers. Well, you're defnitely right about Dearie, and I'd much rather look at a picture of her than one of Trump. I have a couple of plants like yours, descendants of plants I'd had for decades. (Remember -- I brought cuttings of them to London!) Hope you endure the cold weather OK! That holiday decoration is...interesting. What is it, Mary, that you are calling a "jumper" -- not a pullover/sweater, as they would say in the U.K. (right? ), and we don't use the word up here for clothing (it's what we'd call a deer, sometimes). Do you mean a long, sleeveless top, more like a mid-thigh-length dress? Or ...? 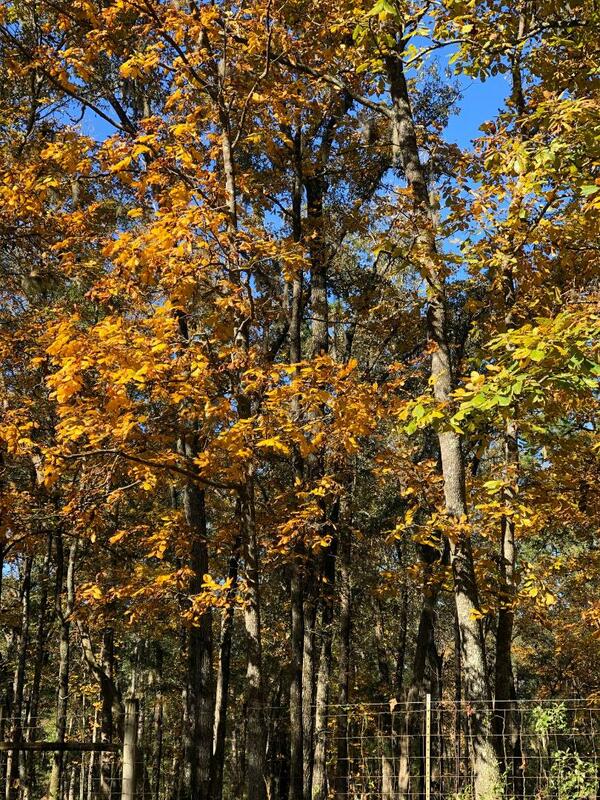 the trees against a so blue sky, wonderful! I have not walked in such a long time, I don't think I can. I have lost interest...Dearie is the best! You wearing ear rings is BEST. Melania is BEST, at being atrocious and weird, she never declared what BE BEST meant,did she. Anyway She and her Orange lump are being best at being worst and so it goes, every damned day. Pelt of Satan! Perfect description! I admire your walks. Sorry to hear about Mr Moon’s back.